S. Oppenheimer - 148 Eldridge St. The signs here at 170 Eldridge St., New York City, read Office of / S. Oppenheimer (over the door to left) and S. Oppenheimer (over the door to the right). But when S. Oppenheimer occupied the building (1875-1879) the address was 148 Eldridge St. (the buildings on Eldridge St. were renumbered approximately 1885). S. Oppenheimer & Co. were founded by Sigmund Oppenheimer (1850-1903) in Chicago in 1868. Later partners in the business were two of Sigmund Oppenheimer's brothers, Julius Oppenheimer (1857-1935) and Louis Oppenheimer (1864-1924). An account written by Lawrence C. Stix, a grandson of Julius Oppenheimer, specifies that its original location was 2700 Wabash Avenue, Chicago, "and its purpose was to profitably sell animal casings to sausage manufacturers." (This account is available on the blog, jacullman.wordpress.com.) The Oppenheimer brothers were immigrants from Mannheim, Germany, a city in Baden-Wurtemberg that lies at the confluence of the Rhine and Neckar Rivers. 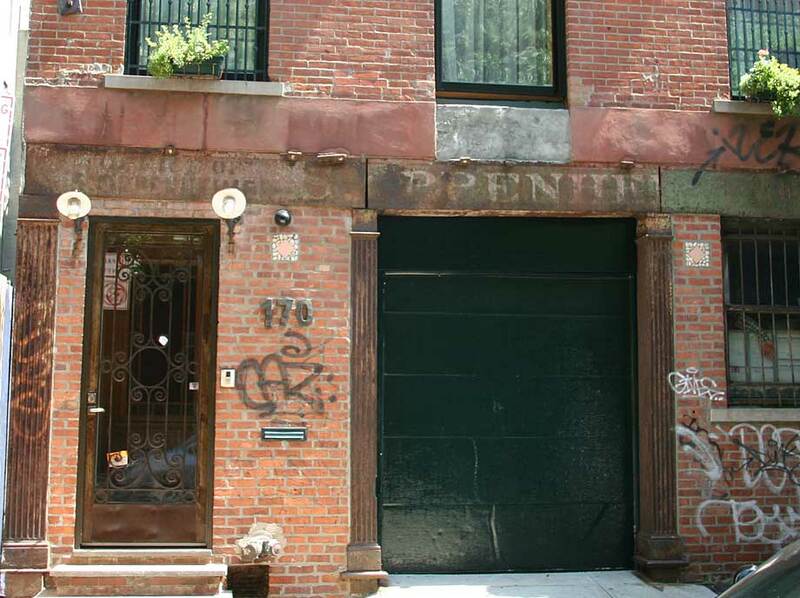 In the 1880 U. S. Census Sigmund and Julius Oppenheimer lived together at 241 E. 18th St., Manhattan. Sigmund was 30 years old, married, with three young children. Julius was 23, single, and lived with his brother. Their occupations were described as "Importer Cases & Bbl." (What I have read as "Bbl" is possibly something like butcher supplies.) The "Cases" were sausage casings. They described themselves as importers, but what they were importing were sheep, lamb, cattle, hog and goat intestines that were manufactured into sausage casings. The 1880 U. S. Census (non-population schedules) for manufacturers included J. Openheimer, Sausage Casings, in New York City. The company owned $500 in capital and $3000 in materials. They employed an average of four workmen, paid as skilled laborers at $1.50 per day for a ten hour day. Total paid in salaries for the year was $1800. They were in fulltime operation throughout the year, and the value of the past year's production was $7000. These modest figures indicate a small but profitable business. A competitor, the Union Casings Assoc., employed 20 men and reported $38,000 income from sales the same year. The first listing that clearly identifies Sigmund Oppenheimer in New York city directories occurs in 1872 when his business (called "skins") was located at 5 Frankfort St. The previous year, 1871, had him at the same address as an editor. The 1870 U. S. Census (2nd Enumeration, dated Dec. 1870) recorded the Oppenheimer family living at 315 E. 10th St. in New York's 17th Ward. Sigmund, age 21, was head of household, and his occupation seems to read "News Paper." The family consisted of his mother, Rosa, age 50, three sisters, Sophia, Mena and Adelaide, and his younger brothers, Julius, age 13, and Ludwig (Louis), age 7. Did Sigmund Oppenheimer work in an editorial job before converting to importer? There were no directory listings prior to 1871. Sigmund Oppenheimer's petition for naturalization is dated 25 September 1876. In 1892 he applied for a passport, and declared that he was born 18 April 1850 in Mannheim, Germany. He emigrated on the SS Asner Weser sailing from Bremen on the 10th of Dec. 1868. He asked that the passport be sent to S. Oppenheimer at 96 Pearl St. New York City. 96 Pearl St. was the home of S. Oppenheimer & Co. from 1880 until 1925/6. Sigmund Oppenheimer's obituary in the New York Times, 2 September 1903, p. 7, read as follows, "Sigmund Oppenheimer died of heart disease at his residence, 66 East Eightieth Street, on Monday, in the fifty-fourth year of his age. Mr. Oppenheimer was born in Mannheim, Germany, in 1850, and came to this country in his eighteenth year. Before coming here he was an apprentice in a packing house, and shortly after his arrival found work of the same description. When he learned to speak the language he went into business for himself, and founded the firm of S. Oppenheimer & Co., who have an office at 96 Pearl Street, in this city, and offices in Chicago, London, Hamburg, and Wellington, New Zealand. At the time of his death he was a member of the Produce Exchange, the Chamber of Commerce, the Freundschaft Club, and the Ethical Culture Society." In the 1900 U. S. Census Julius Oppenheimer lived at 1200 Madison Ave., Manhattan. He was 43 years old and had been married to his wife, Rozelle, 9 years. The couple had two daughters, Babette, age 6, and Florence, age 3. In 1906 he applied for a passport, and declared that he was born 18 May 1857 in Mannheim, Germany. He emigrated on the SS Union sailing from Bremen on the 6th of Nov. 1869. The U. S. Census reports of 1910, 1920 and 1930 also record Julius Oppenheimer living in New York City. By 1930 he had retired and his occupation was "None." His obituary in the New York Times, 31 October 1935, p. 19, read simply, "Julius Oppenheimer, formerly for many years head of S. Oppenheimer & Co., dealers in sausage casings, died Tuesday at his home, 270 Park Avenue, of heart disease at the age of 78. Surviving are his widow, Rozelle Frank Oppenheimer, and two daughters, Babette O. Stix and Florence O. Lemaire." S. Oppenheimer & Co. were in business in New York City from approximately 1872 to 1960. An article in Manufacturing and Wholesale Industries of Chicago, 1918, credits Sigmund Oppenheimer as founding the company in 1868. 1868 is the year Sigmund Oppenheimer immigrated. In May 1921 Louis Oppenheimer applied for a passport. Attached to the application was this letter with the S. Oppenheimer letterhead. Julius Oppenheimer, president, signed the letter. This advertisement for S. Oppenheimer appeared in Directory and Hand-Book of the Meat and Provision Trades, 1895, when their New York address was 96-98 Pearl St.. Here again the claim is "Established 1868." This ad for S. Oppenheimer appeared in the publication Butchers' Advocate, vol. 23, no. 13, 11 August 1897. Sausage Casings of Every Description! A much later Oppenheimer ad appeared in the Butchers' Advocate, Oct. 1922. At this time Oppenheimer New York offices were still located at 96 Pearl St. Apparently Oppenheimer factories in New Zealand were doing well in the 1890s. The website nzetc.org quotes from The Cyclopedia of New Zealand, dated 1897. These ads in the National Provisioner, 30 June 1917, p. 12, show several addresses for S. Oppenheimer.